Shortsightedness, or myopia, seems to be endemic in urban populations. The National Institutes of Health suggests that myopia cannot be prevented, and that neither reading nor watching television causes myopia. I find that doubtful, as reading is a rather unnatural activity, and there is evidence that myopia is significantly associated with amount of reading at early ages. Trying to avoid reading early in life would not be a highly recommended Paleolithic-mimicking choice, except for those who later decide to live among hunter-gatherers. (In spite of our romantic views of hunter-gatherer life, it is very rare to see an urbanite do this outside the context of anthropological studies.) Education requires a lot of reading, and without education in urban environments one is likely to end up suffering from other diseases of civilization. Diabetes, for example, is strongly and inversely associated with education level in urban environments. Also, keeping up with friends on Facebook, without which life as we know it now could go on, requires a lot of reading and writing. A different theory, often associated with Cordain, is that myopia is due to consumption of industrial carbohydrate-rich foods. Interestingly, according to Cordain and colleagues, myopia is typically accompanied by higher stature, a finding that is supported by empirical evidence. The idea here is that industrial carbohydrate-rich foods promote abnormal growth patterns during developmental stages, which arguably include abnormal growth of the human eye and its various structures. Avoiding industrial carbohydrate-rich foods during developmental stages is feasible, but currently very difficult given public health policies that strongly promote the consumption of some of those foods, during development stages, as healthy choices (e.g., cereals). In part as a result of those policies, and also due to budget constraints (those foods tend to be generally cheap), industrial carbohydrate-rich foods are frequently served as meals in schools. Okay, now to the main topic of this post. Let us say a person has myopia, should he or she fix it surgically? As one ages, the ability to read at a short-distance (as in reading from books, or from a computer screen) goes down, because the ability to focus on short-distance objects becomes impaired. This phenomenon is called presbyopia, and is also associated with excessive reading. Therefore it could be called a disease of civilization as well. Most college professors at the level of Associate Professor and higher I know (that is, older folks, like me) have developed it, sometimes as early as in their late 30s. In the general population, normally presbyopia sets in between 40 and 50 years of age, requiring the use of "reading glasses" afterwards … except for those with myopia. This is sometimes called the “myopia payoff of presbyopia”. 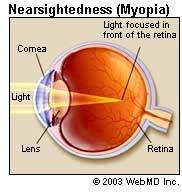 People with myopia are often able to read well, without the help of glasses, after presbyopia sets in. The reason is that myopia essentially opposes presbyopia at short distances. Someone with myopia will still have it after presbyopia sets in, and thus will have difficulty seeing at long distances, but will frequently be able to read well at short distances. So, if you undergo eye laser surgery (the most common type) to correct myopia early in life, you may create reading problems after 40. P.S. : A friend of mine who has been studying this tells me that eye problems in general are caused by avoidance of indirect sunlight. I am planning on looking into this more deeply in the future. By definition LC is about dietary carbohydrate restriction. If you are reducing carbohydrates, your proportional intake of protein or fat, or both, will go up. While I don’t think there is anything wrong with a high fat diet, it seems to me that the true advantage of LC may be in how protein is allocated, which seems to contribute to a better body composition. LC with more animal protein and less fat makes particularly good sense to me. Eating a variety of unprocessed animal foods, as opposed to only muscle meat from grain-fed cattle, will get you that. In simple terms, LC with more protein, achieved in a natural way with unprocessed foods, means more of the following in one's diet: lean meats, seafood and vegetables. Possibly with lean meats and seafood making up more than half of one’s protein intake. Generally speaking, large predatory fish species (e.g., various shark species, including dogfish) are better avoided to reduce exposure to toxic metals. Organ meats such as beef liver are also high in protein and low in fat, but should be consumed in moderation due to the risk of hypervitaminosis; particularly hypervitaminosis A. Our ancestors ate the animal whole, and organ mass makes up about 10-20 percent of total mass in ruminants. Eating organ meats once a week places you approximately within that range. In LC liver glycogen is regularly depleted, so the amino acids resulting from the digestion of protein will be primarily used to replenish liver glycogen, to replenish the albumin pool, for oxidation, and various other processes (e.g., tissue repair, hormone production). If you do some moderate weight training, some of those amino acids will be used for muscle growth. In this sense, the true “metabolic advantage” of LC, so to speak, comes from protein and not fat. “Calories in” still counts, but you get better allocation of nutrients. Moreover, in LC, the calorie value of protein goes down a bit, because your body is using it as a “jack of all trades”, and thus in a less efficient way. This renders protein the least calorie-dense macronutrient, yielding fewer calories per gram than carbohydrates; and significantly fewer calories per gram when compared with dietary fat and alcohol. Dietary fat is easily stored as body fat after digestion. In LC, it is difficult for the body to store amino acids as body fat. The only path would be conversion to glucose and uptake by body fat cells, but in LC the liver will typically be starving and want all the extra glucose for itself, so that it can feed its ultimate master – the brain. The liver glycogen depletion induced by LC creates a hormonal mix that places the body in fat release mode, making it difficult for fat cells to take up glucose via the GLUT4 transporter protein. Excess amino acids are oxidized for energy. This may be why many people feel a slight surge of energy after a high-protein meal. (A related effect is associated with alcohol consumption, which is often masked by the relaxing effect also associated with alcohol consumption.) Amino acid oxidation is not associated with cancer. Neither is fat oxidation. But glucose oxidation is; this is known as the Warburg effect. A high-protein LC approach will not work very well for athletes who deplete major amounts of muscle glycogen as part of their daily training regimens. These folks will invariably need more carbohydrates to keep their performance levels up. Ultimately this is a numbers game. The protein-to-glucose conversion rate is about 2-to-1. If an athlete depletes 300 g of muscle glycogen per day, he or she will need about 600 g of protein to replenish that based only on protein. This is too high an intake of protein by any standard. A recreational exerciser who depletes 60 g of glycogen 3 times per week can easily replenish that muscle glycogen with dietary protein. Someone who exercises with weights for 40 minutes 3 times per week will deplete about that much glycogen each time. Contrary to popular belief, muscle glycogen is only minimally replenished postprandially (i.e., after meals) based on dietary sources. Liver glycogen replenishment is prioritized postprandially. Muscle glycogen is replenished over several days, primarily based on liver glycogen. It is one fast-filling tank replenishing another slow-filling one. Recreational exercisers who are normoglycemic and who do LC intermittently tend to increase the size of their liver glycogen tank over time, via compensatory adaptation, and also use more fat (and ketones, which are byproducts of fat metabolism) as sources of energy. Somewhat paradoxically, these folks benefit from regular high carbohydrate intake days (e.g., once a week, or on exercise days), since their liver glycogen tanks will typically store more glycogen. If they keep their liver and muscle glycogen tanks half empty all the time, compensatory adaptation suggests that both their liver and muscle glycogen tanks will over time become smaller, and that their muscles will store more fat. One way or another, with the exception of those with major liver insulin resistance, dietary protein does not become body fat if you are on a LC diet. This is such a common phenomenon that you’d expect to see it discussed more often – people fasting for a non-negligible number of hours and ending up with a bigger waist. However, it is very difficult to find anything published on it. (Lyle McDonald discussed a related phenomenon on this post on whooshes and squishy fat.) I am not talking about only a perceived bigger waist; I am talking about measurably bigger. This frequently happens with folks who were obese, lost a lot of body fat, and are trying to get rid of the stubborn lower abdominal fat. Fasting and ending up with a bigger waist; how is that possible? Contrary to popular belief, this is very unlikely to be due to the body turning muscle protein into glucose, and then converting that glucose into fat for storage in fat cells around the waist. When you are fasting, one factor strongly opposes that transformation. The body is in net body fat release mode, due in part to low circulating insulin, and thus body fat cells are essentially rejecting glucose. Blood glucose levels are maintained, to feed the brain, but uptake by adipocytes via GLUT4 isn’t happening. So where does the bigger waist come from? When people fast they typically drink water, quite often lots of it. A reasonable explanation for the bigger waist is that body fat cells store water in place of fat, as fat becomes energy. Since water is denser than fat, the stronger gravitational pull will lead to a larger bulge around the lower abdominal area, increasing waist circumference at the point it is widest. The amount of fat mass, however, is going down due to fasting. In the obese, body fat cells generally become insulin resistant, even though many people believe the opposite to be true. This leads to the creation of new body fat cells (hyperplasia) to store the extra fat. If body fat loss is maintained over time, I’d expect the body to get rid of those fat cells that were created through hyperplasia during the obese period. The literature, however, seems to suggest that the number of body fat cells is set before adulthood, and does not change afterwards. I am skeptical, as the body seems to be very good at getting rid of cells and tissues that are not used. The loss of those extra body fat cells may bring the number of adipocytes to pre-obesity levels, but for many people quite some time is needed for that to happen. Often in the order of months; maintaining reasonably low body fat levels. So don’t despair if you end up with a bigger waist around noon after skipping breakfast, or before dinner after fasting the whole day. 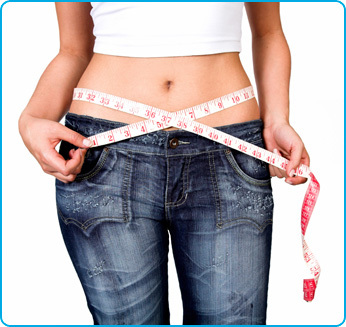 That may be a good sign; a sign that you are actually losing abdominal fat. A commenter wrote here some time ago that she liked to eat rice because rice can be easily used to separate food items on a plate. One can just as easily use sweet potatoes to do that; preparing the sweet potatoes in much less time than the rice. This post explains how, with a simple recipe. - Cut up half of a sweet potato as shown on the first photo below, adding coconut oil or butter to prevent the pieces from sticking to a microwave-safe saucepan. - Microwave the sweet potato pieces in high heat for about 5 minutes. - Use the sweet potatoes to separate food items as in the second photo below, showing beef liver and meatballs with their respective sauces. - Cover the dish with a wet paper towel to prevent spilling, and microwave it for as long as needed to heat up the meats. In this case, 2 minutes in high heat was enough. That will further cook the sweet potato, but not to the point of burning it. The above assumes that the beef liver and meatballs are leftovers that had been cooked before. In this example, we have about ½ lb of meat and ½ of a sweet potato. As far as plant foods are concerned, sweet potatoes are at the very high end of the nutrition density scale. This is a very nutritious and satiating meal (for me) with over 55 g of protein, as well as a great mix of macro- and micro-nutrients.